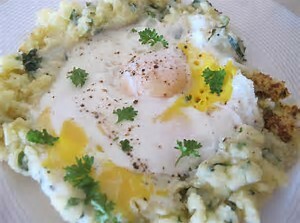 I thought this was a great use of leftover Thanksgiving mashed potatoes, definitely not a new idea but a good one. This recipe is from “Out of Alaska’s Kitchens” printed by the Ketchikan Alaska Chronicle in 1958. Wishing you a blessed holiday full of Joy and laughter – Enjoy! Shape the seasoned mashed potatoes into balls, using about 1/3 cup to each ball. Place balls on a greased cookie sheet. With a spoon press the center of the ball to form into cup shapes. Drop an egg into each cup, season with salt and pepper (I think you could also place them into greased cupcake tin). Personalize them if you like by adding cooked bacon, ham, cheese or add any spice you like. Bake in a slow oven 325 degrees for 20 minutes or until the egg is as firm as desired.